Transit Gateway Peering connects two or more Aviatrix Transit Gateways in a partial or full mesh manner, as shown in the diagram below. 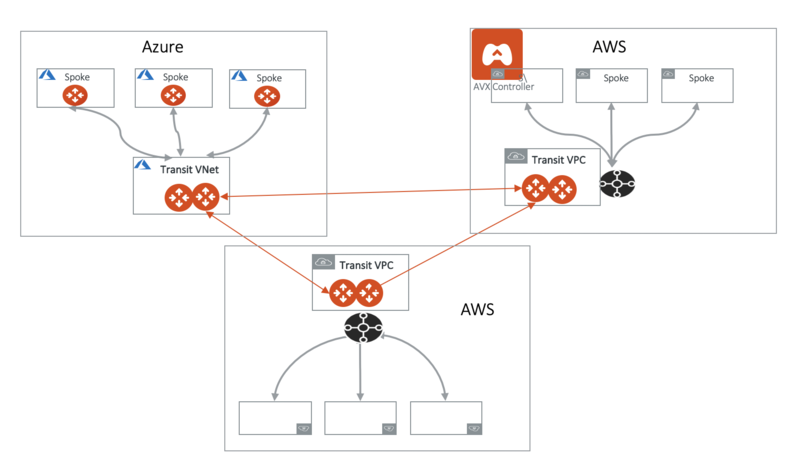 The Aviatrix Transit Gateways may be deployed in AWS or Azure, each Transit GW connects a group of Spoke VPC/VNets. As a result of Transit Gateway Peering, two groups of Spoke VPCs can communicate with each other via the Transit Gateways. The instructions are as follows. If you have not done so, follow the instructions in here to launch an Aviatrix Transit GW. Repeat to launch more Transit GWs. The Aviatrix Transit GWs are typically launched during the workflow of TGW Orchestrator, Transit Network or Transit DMZ. If the transit cluster does not need to connect to on-prem, skip the step 3 that connects to VGW/CloudN/External Device. Go to Transit Network -> Transit Peering -> Add New. Select the one of each Transit Gateways and click OK.